The OEM 4K Ultra HD OEM micro camera system uses 1/3inch progressive color MOS chips (3MOS). The camera head GP-UH532HU indicates a space-saving design due to the small size. By considering a required illumination of 2000lx at F8, the camera achieves horizontal resolution of 1600 TV lines and allows precise pictures and brilliant color reproduction in various applications in segments such as ophthalmology, neurosurgery, broadcast or industrial. Panasonic supplies high quality and state-of-the-art 4K OEM components, which can be easily integrated into equipment or systems for different application areas such as medical, scientific, broadcast or industrial. 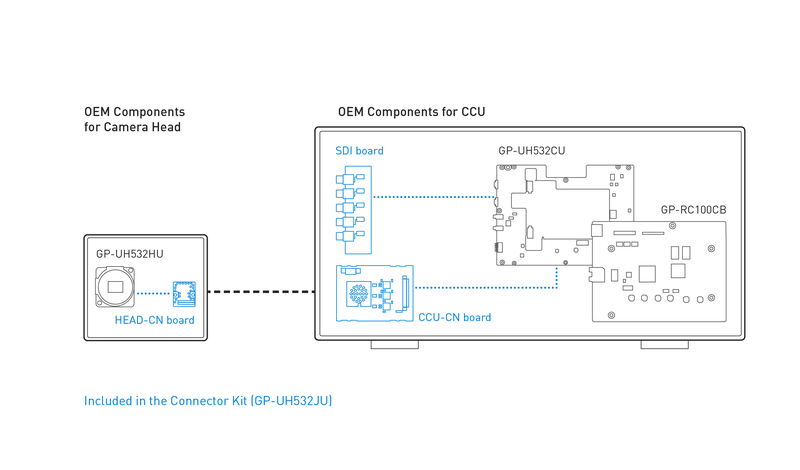 The new Connection Kit (GP-UH532JU) harmonizes perfectly with Panasonic 4K OEM Boards, helping to reduce the development time and unexpected risks. The 4K Ultra HD OEM micro camera supports the video formats 3840x2160/59.94p, 3840x2160/50p, 1920x1080/59.94p, 1920x1080/59.94i, 1920x1080/50p and 1920x1080/50i. The different video formats can be outputted via 2x HDMI and 5x 3G-SDI, simultaneously. Panasonic OEM Micro Camera Recording Solutions . OEM Micro Camera Recording Solution GP-RC100CB The Panasonic OEM Micro Camera... Want to talk to Panasonic?.